Capitalism is Usury. Its defining belief is ‘return on investment’. This is an extension of the ‘time value’ of money, which is the central tenet of modern economics. Capitalism is unthinkable without banking and banking is institutionalized Usury. Usury is Plutocracy. Compound interest makes it unavoidable that the very richest own everything in generations. And this is indeed what happened: Capitalism is one huge global monopoly. All the major banks own each other and most Transnationals plus a huge chunk of land. This juggernaut was built with the plunder of Usury. We have all seen that Rothschild was worth 50 billion in 1850. At 5% per year, this fortune would now be a trillion, at 8% per year Rothschild would now be worth hundreds of trillions. This is why it has been said that ‘compound interest is the strongest force in the Universe’. Modern Capitalism was first clearly visible in the Dutch Republic, where Italian Banking, expelled Iberian Jews, the Reformation, naval power and the acquisition of huge trade fortunes came together in the Amsterdam Empire, which would outshine its much bigger Spanish, British and even French competitors until the mid seventeenth century. Everything that defines modern Capitalism was either invented or came to fruition in Amsterdam. The first Stock Exchange, Multinationals (the East Indies Company, which would rule over Indonesia with unrestrained Corporatocracy for centuries), and most importantly, a Central Bank, the ‘Amsterdamsche Wisselbank’. And of course a huge pile of money, that would be the envy of Europe even long after its ‘glory’ had subsided. Up to 2500 guilders (estates could be bought for that kind of money) were paid for a single Viceroy Tulip bulb at the peak . 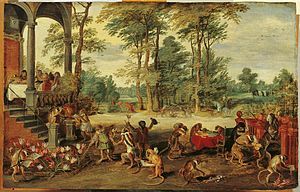 “A Satire of Tulip Mania’ depicts speculators as brainless monkeys. Amsterdam also saw the first bubble: the Tulip mania, 1637. This typical banker device, blowing bubbles with easy credit and then popping them by calling in loans, would haunt Western economies for centuries to come. The Dutch Republic resulted from a Calvinist rebellion against Catholic Spain. Calvin is considered by many to have been Jewish. He openly defended Usury. This was in an era that the Medieval era of Usury prohibition was in terminal decline. Calvinist thought was also infected by the typically Jewish notion that wealth is a sign of God’s favor. Notwithstanding Usury prohibition, Jewish Usury had been a huge issue throughout the Middle Ages and it does not require a great leap of the imagination to see that Capitalism is in fact the modern equivalent of what was once known as Jewish Usury. Jewish fortunes and their methods played a large part in Amsterdam. Their ships would also dominate the growing slave trade on America. They had come from Spain, after being expelled in 1492. Holland was known at the time for its ‘tolerance’. Amsterdam was the first great star of high finance. Opulence acquired through trade became Capital, looking for returns. And here we see that Capitalism is about finance, not production or consumption. Finance rules over producers, workers, consumers, farmers, crafstmen and industrialists alike. They lend to those they control or want to control and withhold credit to those for whom they have no purpose. Usury gives them their take of any venture. By keeping money scarce, they keep labor cheap. This is how money rules. Amsterdam peaked in 1648, when the peace of Westphalia ended both the 80 year war for independence with Spain and the 30 year war in Germany. But after the peak comes the decline and already in the fifties problems began to mount when Cromwell landed a blow on Dutch naval supremacy with the Acts of Navigation. The Jews had been expelled from Britain in 1290. This was a few decades after the Magna Carta, which clearly points at Jewish Usury as a huge problem at the time. Cromwell, who was a calvinist Puritan, negotiated extensively with Amsterdam Jews about resettlement. He probably was a tool of Jewish/Amsterdam finance to begin with. Resettlement came with the promise of making London a better Amsterdam. And while British merchants (and many others too) were against the readmittance of the Jews, Cromwell went ahead anyway. The Puritans were optimistic and naive and thought they could ‘redeem’ the Jews. But while Jewish Capital indeed pushed Britain’s Empire to unprecedented heights, there was no redemption: by the end of the 19th century the British Aristocracy had been entirely Judaized. While Cromwell, as a tool of Amsterdam Imperialism, ultimately failed, the Jews did not relent and they had a second shot at London with the Glorious Revolution, when William III of Orange, Stadtholder of Holland, became William III of Britain and the Dutch Republic and England were united in a personal union. He repaid his financial backers by chartering the Bank of England in 1694 and this was the official entry of Capitalism in Britain. It came with the end of sovereign money and the ascent of Gold: until then the British economy had been financed with Talley Sticks, simple pieces of wood issued by the King. British partners in the Bank paid for their shares with them, but the first thing the Bank did was take them out of circulation. The Bank of England is only the eigth bank in history and is the second oldest to survive today. The real history of the United States is not about the War of Independence and the Constitution. It’s about banking. The United States did not revolt over ‘taxes without representation’. According to Benjamin Franklin the real reason for the War of Independence was that Whitehall forced scarce money through Britain’s Gold Standard on the Colonies, who had thrived with their own Colonial Scrip. A depression was the inevitable result. Only a few years after nominal independence, Hamilton’s first Bank of the United States brought Capitalism to the United States. It was closed in 1800, but in 1816, in the aftermath of the war with Britain, a second Bank of the United States (a privately owned corporation) was opened with a 20 year charter. The heroic President Andrew Jackson did not renew this charter and miraculously survived an attempt on his life. His last words, ‘I killed the Bank’ still ring triumphantly through the ages. Unfortunately, he failed to replace it with a decent monetary system and the country was plunged in a depression because of a tanking money supply. This left the Whigs, Abraham Lincoln prominently among them, plenty of scope to campaign for a new ‘National’ Bank, which came in the aftermath of the Civil War. In 1913 the Federal Reserve Bank was founded. This privately owned corporation is owned by primarily Jewish ‘member banks’. The presidents of the Federal Reserve are always Jewish and by far most of its board members are too. It’s no secret Wall Street is run by the Jews and is now the global standard bearer of Jewish Usury with derivatives being the scam du jour. Of course there are Americans in Wall Street too, just as there are Englishmen in the City or Germans in Deutsche Bank, but whereas these nationalities compete amongst each other, the Jews are strong in all nations and this gives them supremacy. Equally true is that the Jewish many gain nothing from the banking prowess of their ‘elites’. They may have some privileges, but on the other hand they’re also easily duped into nasty affairs or sacrificed like the pawns we all are. But considering the above history of Capitalism and Jewish Usury, it is very hard to avoid the conclusion that they are the same thing. Capitalism and its ‘return on investment’ is clearly the successor of medieval Jewish Usury. It arose during the destruction of medieval Usury prohibition. Its typical devices, Usury, Banking, the Stock Exchange, asset bubbles, Transnationals, all were already present in Amsterdam. It was this force that migrated to Britain and the US. It was in these three financial Empires that Captitalism showed its unrestrained imperialist designs. Already the poor lose up to 50% of their income to Usury, mostly passed on by producers in prices. The middle classes are somewhat better off, but they are being decapitated everywhere. Usury only benefits the richest 10%, while most of the money ends up with the ‘fabulously’ wealthy. The enslavement is total: most people work the first two and half days of the week to pay off the bank. Even if they have no debts. And we face not only enslavement, but extinction. Mass immigration, combined with the demographic catastrophy caused by the trinity of feminism, the not-so-gay lobby, and sexual ‘liberation’, is now threatening to actually destroy the white race. Whites are expected to be a minority all over the West in 2050/2060 and irrelevant by the end of the century. Capitalism is the core of the Jewish Question. All their other depravities, including Zionism and (Cultural) Marxism were built and financed from the Capitalist powerbase. The Jewish Question can only be reasonably resolved by reforming money and ending its rule through Usury. Jesus did not go to the temple to cleanse. He came to the temple to announce the destruction of a whole way of life. Those who operated the temple had no power to silence Jesus and put him to death. Those powers were held by the Roman retainers. The charges that were leveled against him can be summed up as insurrection. There were three specific charges: encouraging non-payment of taxes, threatening to destroy property (the temple), and claiming to be a king. It was the temple incident that took Jesus from being an irritating, but harmless country rebel from the rural north to a nuisance in a city that controlled the great tradition. Rome’s retainers killed him on a cross. In other words, Jesus wasn’t sentenced to death until he challenged the money changers. What Does it Mean to Do God’s Work? The head of Goldman Sachs said he’s doing “God’s work” with his banking activities. The head of Barclays also told his congregation that banking as practiced by his company was not antithetical to Christian principles. Are they right? Is big banking as practiced by the giant banks in harmony with Christian principles? Initially, the Bible does not counsel us to ignore the breaking of laws by the the powerful. In fact, the Bible mentions justice over 200 times — more than just about any other topic. The Bible asks us to do justice and to stand up to ANYONE — including the rich or powerful — who do injustice or oppress the people. In Scripture there is a constant call to seek justice. Jesus got upset at the Pharisees because they neglected the weightier matters of the law, which He defined as justice and the love of God . . . Isaiah 58 complains about the fact that while the people of God are praying and praying and praying, they are not doing anything about the injustice. Should Christians just pray for justice and leave the rest to God? We have to “walk our talk” and put our prayers into action. This is the only place in the Bible where the word “appalled” is used for the way God feels — in other words, the only thing which we know God is appalled by is if people are not doing justice. So if the powerful players in the giant banks broke the laws, they must be held to account. The big banks have engaged in systemic, continuous ongoing criminal fraud. Moreover, the giant banks manipulate currency through the use of schemes such as manipulating interest rates (gaming interest rates in different regions – Libor, Eurobor, etc. – can in turn drive their currencies up or down), high frequency trading and artificially suppressing gold prices (which artificially inflates the value of fiat money) . So to the extent that the giant banks have engaged in any dishonest acts or the manipulation of currencies, they are violating scripture. To the extent that the giant banks have oppressed the poor to increase their riches, they are violating scripture. Due to their looting, inequality is now worse in American than in Egypt, Tunisia, Yemen, most Latin American banana republics … and ancient Rome. Bankers are often the driving force behind war. “Blessed are the peacemakers” (Matthew 5:9), and Jesus would not have taken kindly to waging wars for profit based upon false pretenses. Christ – and his ministry – lives to the extent that we act as God’s hands to confront the big banks which are warping our economy and our world. Postscript: Not all bankers are bad people. For example, many bankers at smaller banks and credit unions are good people who are trying to help their communities. Each must be judged by his own acts.